Like I said in last week’s review, while I quite like Neil Gaiman’s work overall, his recent stuff feels kind of bland to me. Like a rainy November afternoon, or like a big bowl of beef stew where someone forgot the salt, or listening to a song that sounds nice but the volume is down too low and you can’t figure out what the lyrics are. It’s like that. This is to say that there’s nothing really wrong with his books, but that they lack that extra something that would give them oomph. And in the case of The Graveyard Book, I’m pretty sure I know what that extra oomph is. 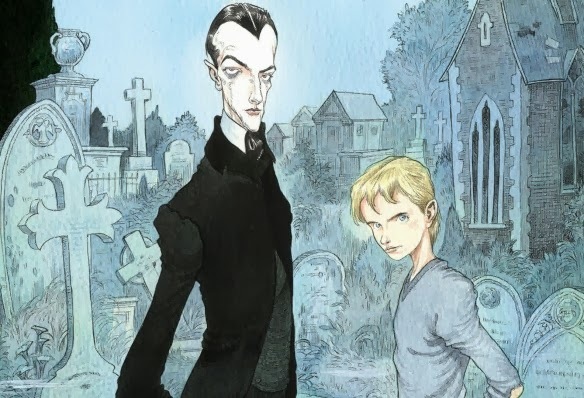 The Graveyard Book is well written and interesting, following a young boy who escapes the murder of his family when he’s a little baby by wandering into a graveyard and being adopted by the ghosts there. He grows up as the only living citizen of the graveyard, parented by Mr. and Mrs. Owen, ghosts, and guardianed by Silas, who is unspecified but definitely not human. Or dead. Other. The boy, Bod, which is short for Nobody Owens, has lots of adventures and learns lots of interesting things while he lives in the graveyard, but Bod does long to get to be out with his own people, in the sun, talking to living, breathing humans. He can’t because the man who killed his family is still out there, and Silas suspects that the man, Jack, is still quite interested in murdering Bod. The book itself is largely episodic, with the only running throughline being that of Bod and his past and Jack’s attempts to kill him. Like I pointed out yesterday, episodic doesn’t necessarily mean bad, but it does mean that the story lacks a defined structure, and while Robin Hood can definitely get away with it, this book rather suffers. The problem is that The Graveyard Book doesn’t appear to be about anything, not in the grand sense of the word. The Ocean at the End of the Lane is about childhood trauma and the scar tissue we build over things we’d rather forget. Braveheart is about the difference that one life, and one passion can make in the grand history of the world. The New Girl is about the joys of finding your family. Most stories are really about something. And that makes sense, doesn’t it? The stories we tell and the stories we love are the best indication of who we really are. I love stories about people of principle standing up against a great evil and trying to save the world. That’s why I love movies and shows as disparate as Supernatural and Chariots of Fire and Rang de Basanti and Buffy the Vampire Slayer. I have a strong tendency to write stories like that too. Because that is what I love, that is what’s in my heart, and that’s what comes out. Good stories are a reflection of the writer’s soul. Bad stories are too, I guess, but they’re much more disconcerting, when you get down to it. 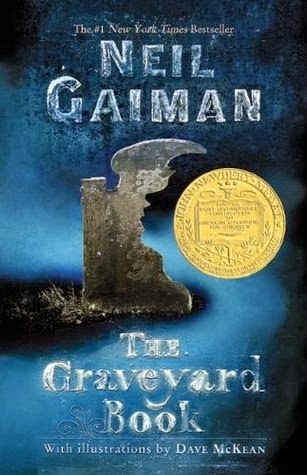 And I think all of this finally comes back to the real problem I have with The Graveyard Book and Neil Gaiman in general, which is, simply, that I worry about his stories. They aren’t about anything a lot of the time, and that bothers me. How do you manage to write a story that isn’t about anything? What does that say about the writer? Of course, the other possibility here is that The Graveyard Book is about something, but I have missed the understanding of what that is. In other words, I just don’t get it. And I don’t rule out that possibility. I’m not perfect, I’m not an infallible analysis machine, and sometimes I just don’t get stuff. That doesn’t mean I don’t like it, but it does mean that I miss the larger emotional resonance. It’s not the end of the world, but it is annoying. Still, for whatever reason, The Graveyard Book leaves me cold. It’s a cute story with some really interesting elements, but it doesn’t mean anything to me, and therefore I have a hard time loving it. There’s a lot in here to be commended, though, whatever my personal preferences. The whole thing is, of course, beautifully written. 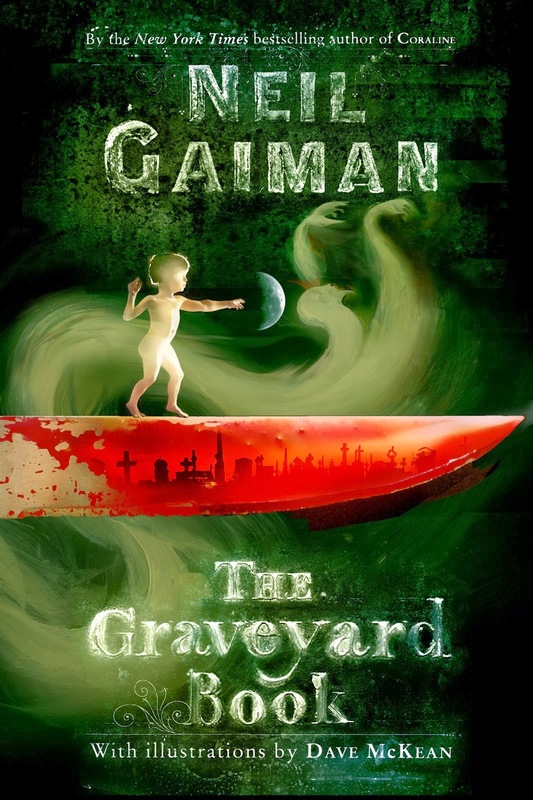 Neil Gaiman has a gift for prose, and this book is no exception. Bod is a really compelling character, and his strange childhood is both entertaining and chilling. You really feel for him, and hope that one day he’ll be able to come out and live in the daylight. Silas is interesting, Ms. Lupescu is one of my favorites, and generally speaking, the cast is fun, well rounded and the story engaging. But somehow it’s just not enough. Part of this is my general disposition against episodic stories. But more than that, I think this has to do with my need for the media I consume to mean something. It’s all well and good to tell a good story, but if you aren’t telling it to me for a reason, then I kind of feel like we’re wasting each other’s time. I don’t mean I want you to be preachy or annoying, but I do mean that I want to know you better as a result of the story you tell me. Tell me who you are, and don’t skip on the feelings. I am always freshly surprised to feel more pity for Gaiman's hollowness than satisfaction with his stories, because his words are so polished. But I don't want to be thinking about the author so much- it's like watching a high school play and feeling nervous for the actors. What his works usually offer me is a launching point for me to imagine a world and characters. I like episodic stories, but only if they offer me a new kernel of heart to add to the mystery of the character, so I usually end up spending more time staring into space with his book open on my lap. That's a good point! This book certainly did help me think some very deep thoughts, and I do love the world he came up with. Just, you know, made me a little awkward.